Planning professionals from many industries need smart scenario planning tools to weigh different options in order to reach the best decision. GeoPlanner for ArcGIS, a new geodesign app from Esri, provides online geospatial tools and a geodesign workflow to help you and other planners and stakeholders collaborate on design and planning decisions both inside and outside your organization. GeoPlanner for ArcGIS is a web-based app that helps you create, edit, and share planning designs. The app integrates online maps, landscape and socioeconomic data, analysis, and sketching tools to help you visualize a plan or design and understand its impact. With the app, you can define your project area, conduct a suitability analysis for your project, create design scenarios, compare and evaluate design alternatives, and report findings. You can use GeoPlanner for ArcGIS to measure the impact of proposed land-use changes and create wildlife conservation plans, emergency response scenarios, and more. For example, using GeoPlanner, you can plan where to locate oil and gas drilling sites in a way that minimizes impact to sensitive wildlife habitat. You can define prime habitat sites using overlay analysis on different landscape data variables, sketch proposed well sites and access roads in a geographic context, and run an impact analysis and assess performance indicators using dashboards. You can then adjust well sites and roads to create alternative scenarios, compare them, and select the one with the least environmental impact. Here is how you can get started with some of the planning and design workflows in GeoPlanner. GeoPlanner includes simple sketching tools that let you draw points, lines, and polygons and create design alternatives. All tools are touch enabled, so you can use your tablet for your designs and access them anywhere. The app is designed to run in web browsers on both desktop and standard-sized tablet devices supporting a minimum 1024 x 768 resolution. Plans and designs usually have metrics that indicate their performance or progress toward a goal. 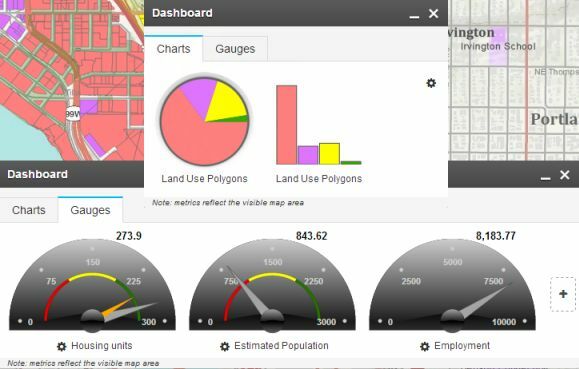 You can use GeoPlanner to create dynamic dashboards that help you visualize those metrics and measure design impacts, both qualitatively and quantitatively. GeoPlanner gives you tools to compare multiple design alternatives and make a geographically informed decision. You can compare two designs side by side and gain qualitative, quantitative, and visual insights. The web-based spatial analysis tools in GeoPlanner will help you better understand the area around and within your planning designs. You can bring in your own planning data, as well as discover other relevant landscape maps and data hosted in Esri ArcGIS Online, to expand the range of your planning and analysis. You can assess suitability and risk by overlaying your data and landscape and socioeconomic data that Esri provides. 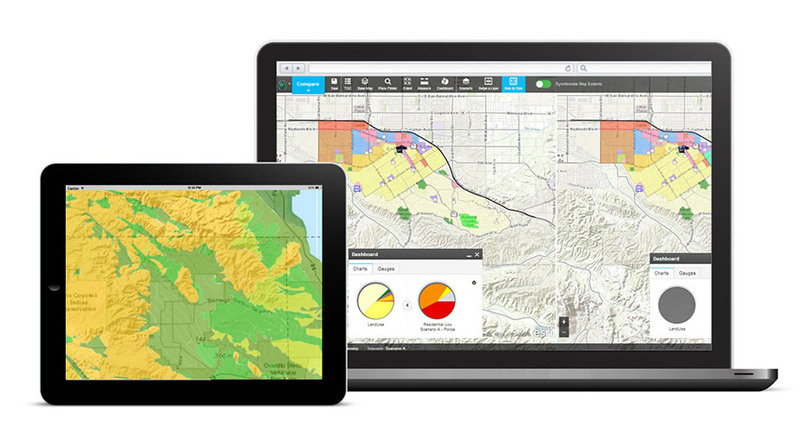 Sign up for a free, 30-day trial of GeoPlanner at ArcGIS Marketplace. 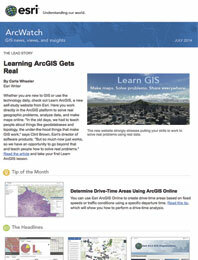 You will need an ArcGIS Online subscription or a trial account to start using the app. People outside the United States should contact the Esri office in their area.